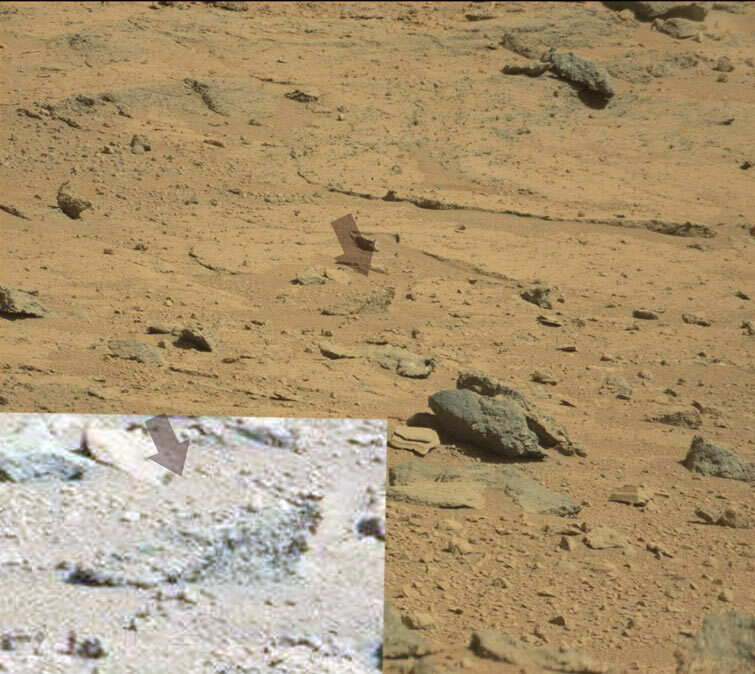 Another good example of reflective rocks, reflecting Curiosity back to us, (the white thing in the middle rock is the rovers wheel leg). And this. Another good example of why l consider Mars to be a wet planet! A hillside with water running off it, due to rainfall or a natural spring? And down the bottom of that a main made, or alien made bridge, with a car on the left of course. Another reflective rock, this one shows Curiosity, and its camera torrent, (the one taking this image) and the blue sky. Once people have landed on Mars, I think this could be a big draw. I figure that Elon Musk's Manned space Mars outpost will have cameras everywhere? But let's hope, not everywhere. I think a Mars TV channel could easily pick up say 5 million viewers per day out of the billions of TV viewers on Planet Earth, and would thus be a very lucrative revenue stream. It could easily be raising hundreds of millions of dollars per annum in revenue through advertising, subscriptions and sales. First one shows the usual water runoff. 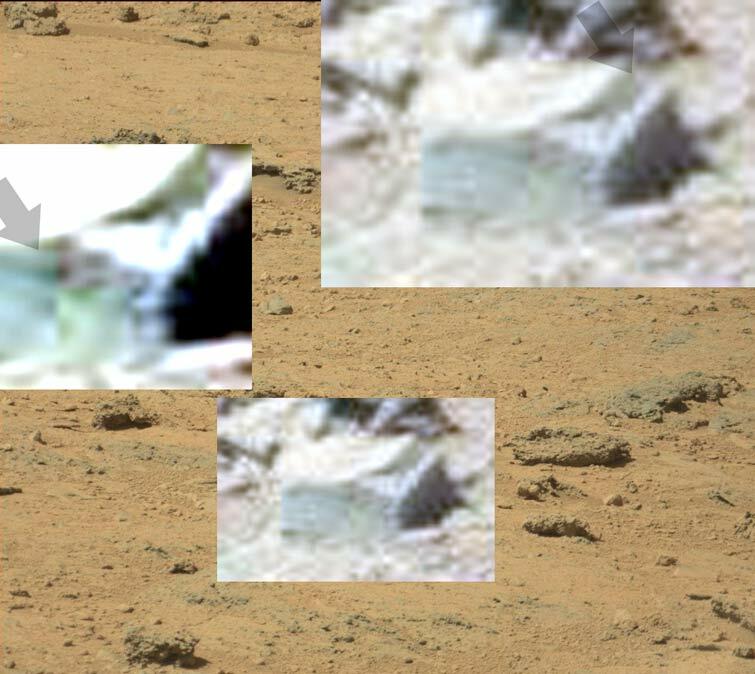 And this one shows Curiosity's camera torrent, nothing unusual about that, but look behind it! Yep, dark or grey clouds, or in other words rain clouds. Nothing much today, just some more puddles. In fact most if not all of the ground here is damp. Natural springs might be causing this, but recent rainfall is more likely, considering the rain clouds we saw in previous, reflective rock images. This is interesting, not the reflected landscape, but the hollow rings. 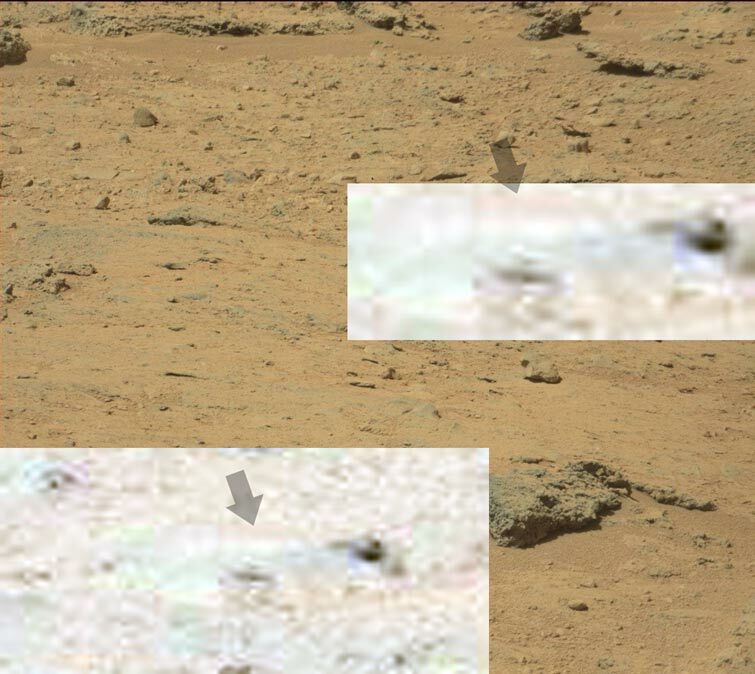 There seems to be three all up, and they are not present on the rover, (l checked) so that can be discounted. There also seems to be smoke coming from one of them but l believe it to be a dust devil. The dark and white things, are Curiosity, and the rest isn't. But interesting to note that the landscape or ground is green, and it also has the usual bright blue, with clouds, (not the red/orange, BS ones NASA keeps showing). There are also more of those rings embedded in the ground. I thought that they might be tree's, but rings with some of the green, algae, or moss growing up them? 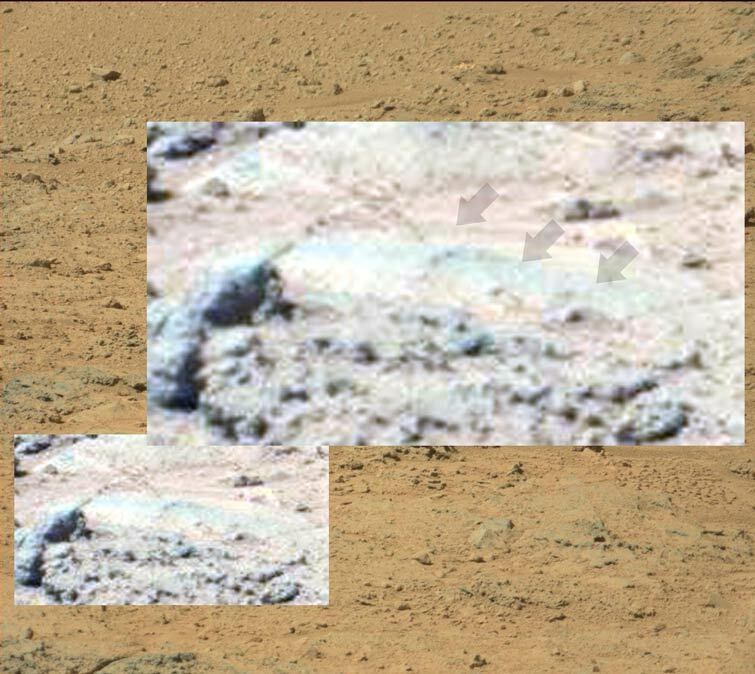 The computer enhancement clearly shows green, and the rover has zero green on it, so Mars very likely has plant life on it. Well, that and everything else. The first, is Curiosity again, (block type thing) then the landscape, blue hills and sky, but the large white thing in the distance? Best guess that it is a band of clouds rising over the distant hills, and these clouds are dark at the base, enough said. 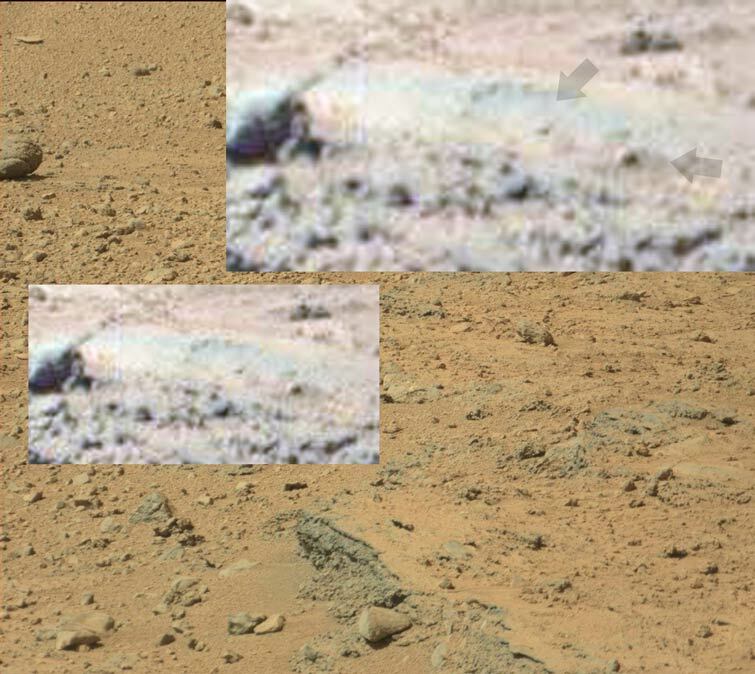 The second rock is a puzzle,....there seems to be a huge structure in the distance. 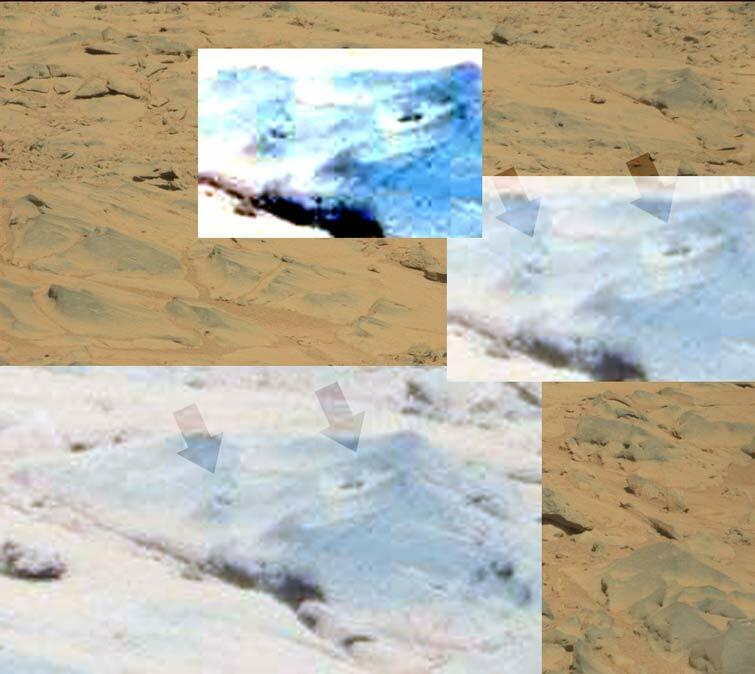 I computer enhanced it to make sure that it wasn't some freak clouds, but no, the CE clearly shows a giant structure of some kind. 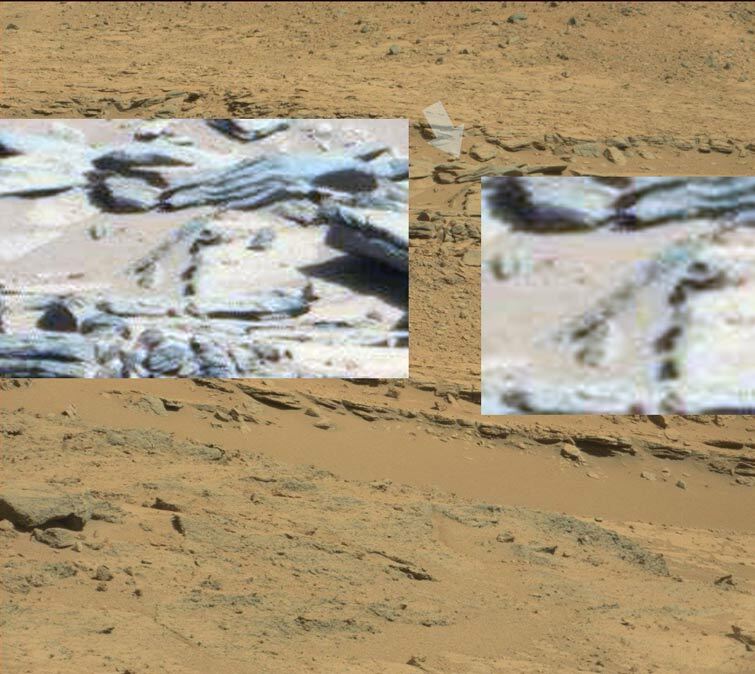 Curiosity drives past the equivalent of an oil refinery, and we get zilch. The world will be shocked when NASA finally owns up, except us of course. No, not an alien artifact, but just Curiosity's front wheel. 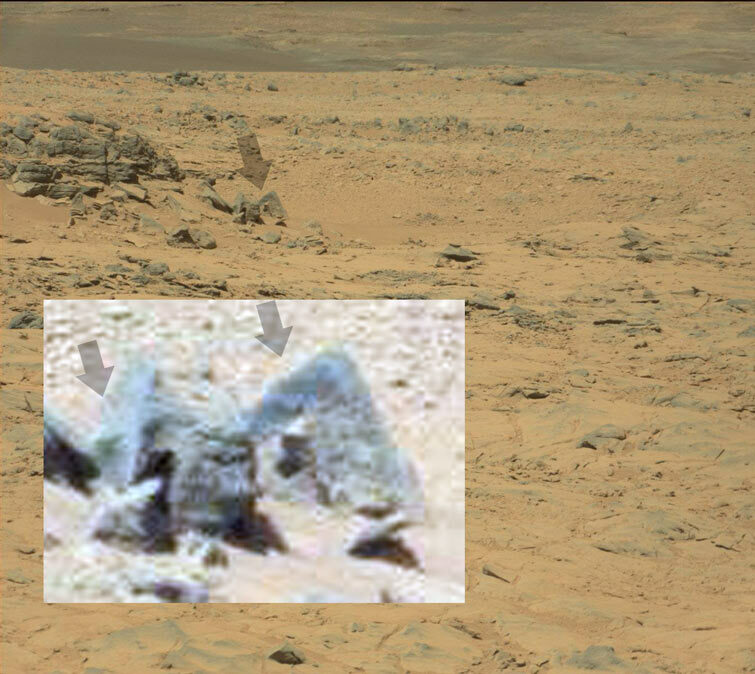 This is one of the best reflective rocks l have seen, and clearly show Curiosity in the distance, driving alone the martian surface. There also appears to be a giant dust storm on the right, and the blue sky is unmistakable, (even on the red filter one, top image). 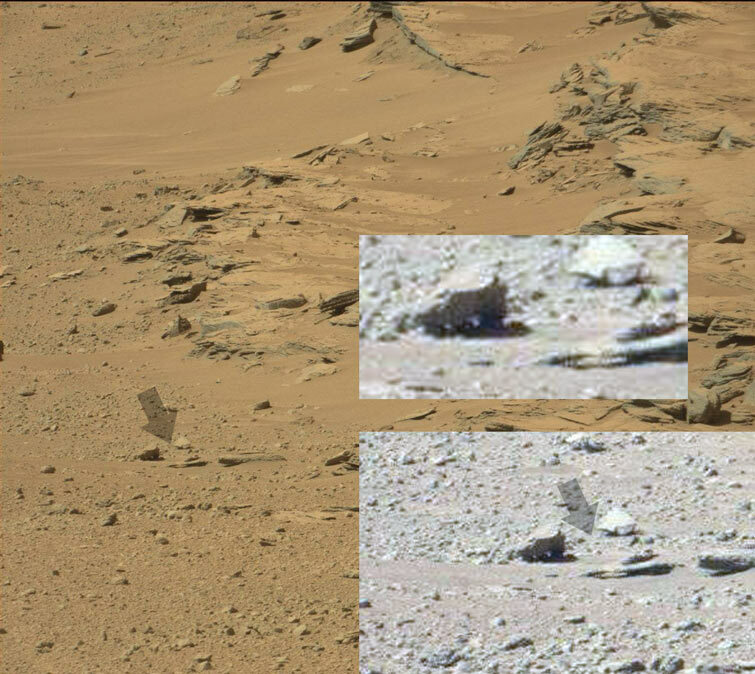 I saw this white thing in this reflective rock, which l thought was a UFO, but it was part of Curiosity's robotic arm, sigh. 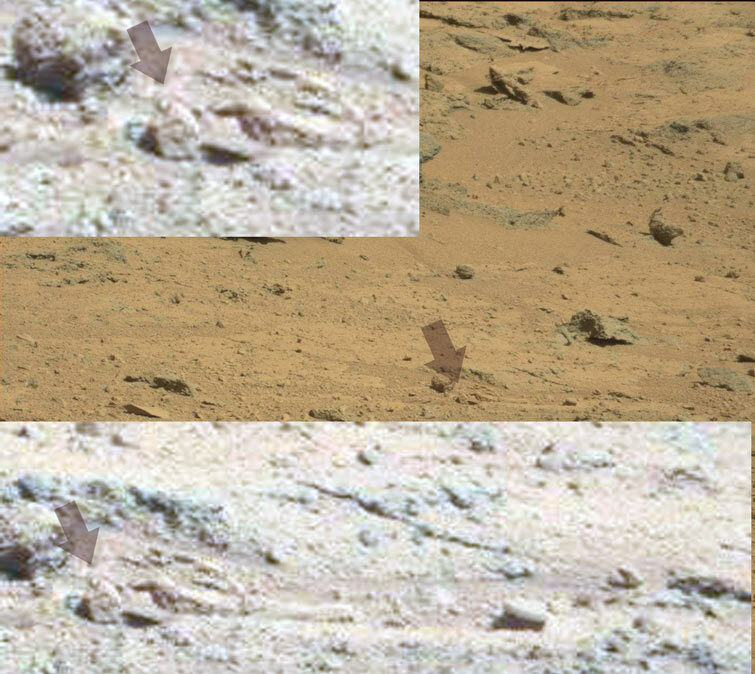 The other thing, (arrow) that looks like an alien looking back at us, is probably genuine. I saw some soil displacement that looked like a footstep, so they may be connected? Nothing much today, just part of Curiosity being reflected back to us, or the sun shining off part of the rover; l initially thought that it was a rock, but other ones showed me that it was part of the rover. 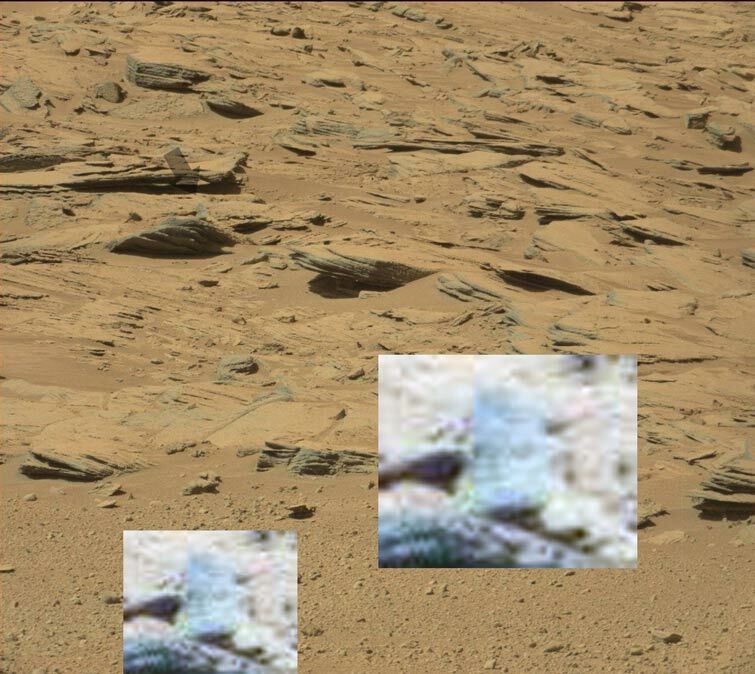 Which shows again, that Mars has shiny rocks. 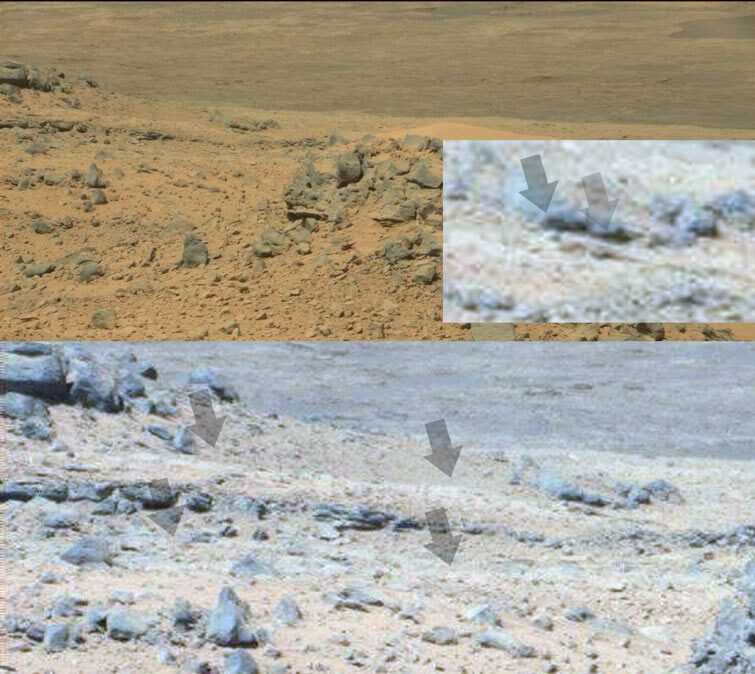 There have also been rumors that if someone see's something on Mars that should not be there, (like rain clouds) that they are labelled a conspirist. Although l tend to use a more ponient label if l come across someone who see's clear evidence in front of them and dismisses it any way they can. This is pretty cool, clear water flowing down a ditch. And l am no expert, but it seriously looks like someone or something dug a ditch for this water? 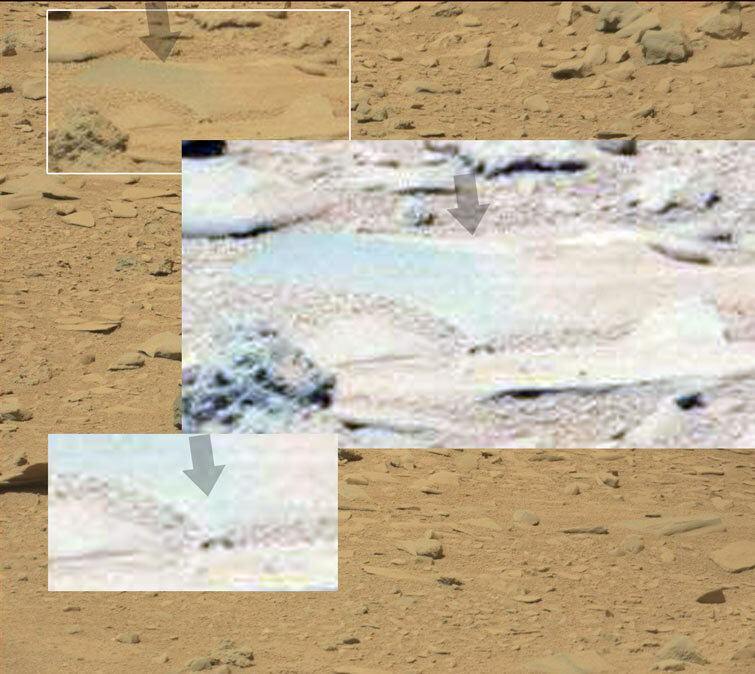 When water flows down a sandy area, it usually doesn't leave dug up sandy soil on one side; and it isn't Curiosity's track, since no tracks are shown further up, and one side is erosion, and the other side isn't. Finally found something interesting. 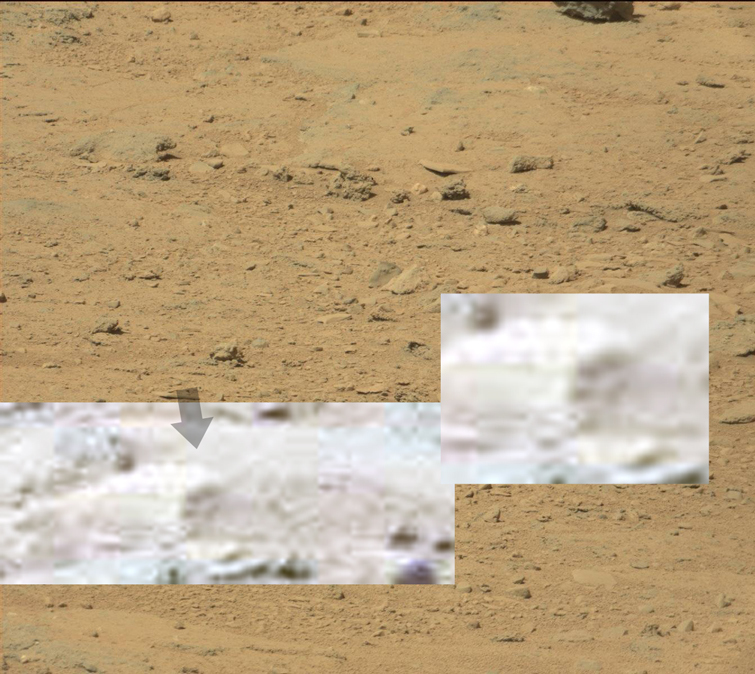 I initially found two pools of water, nothing that interesting about that, apart from the fact that Curiosity avoids it, when we should be seeing closeups? But if you look more closely, there is a machine or a metal ring, and a water flow trough directing water to the lower section. There is also some kind of scaffolding sticking up or across. 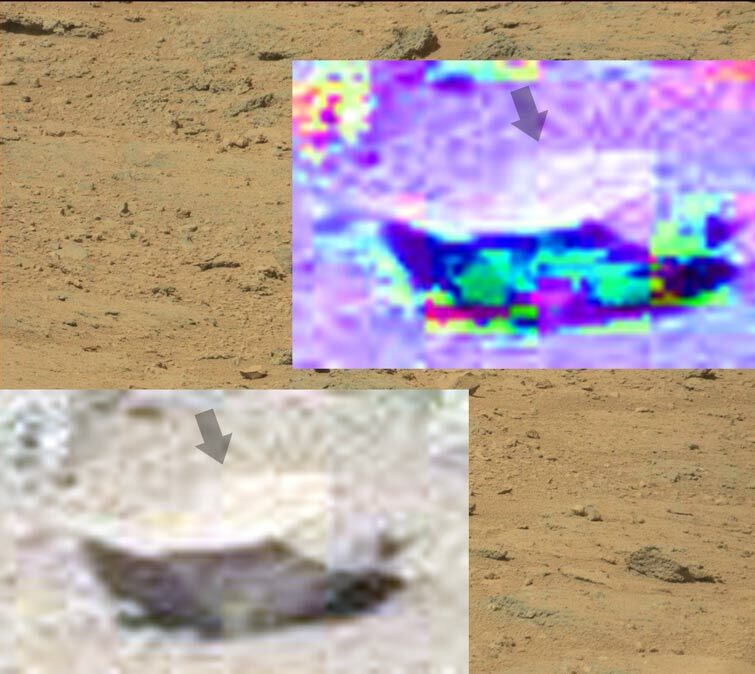 The other yellow thing on the left is probably the rovers reflection, (saw it elsewhere) but the angled water trough, most likely not. 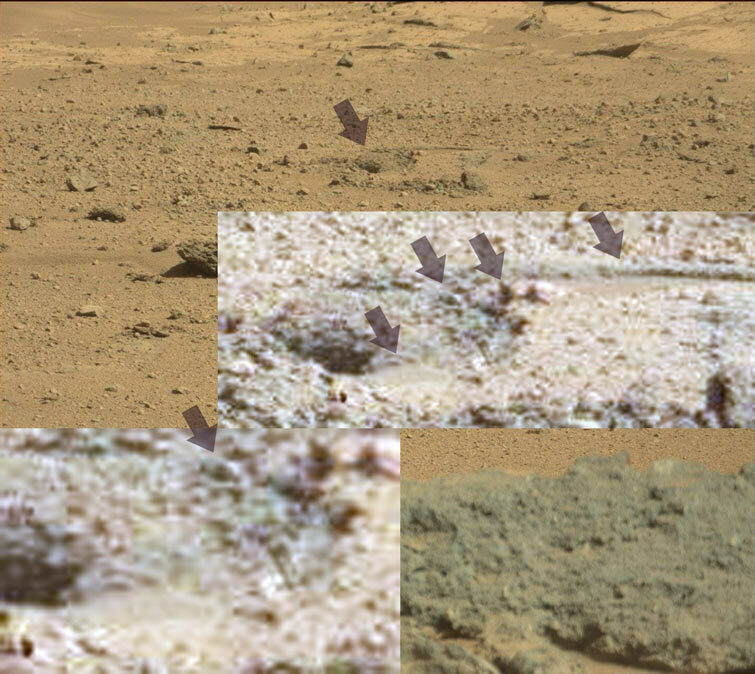 This is the first decent piece of evidence for some time that add's to Mars being wet, and some kind of intelligent life being there, (especially if the machinery shown is metal. After a bit of thought l saw that the metal ring is on both sides, so is most likely a gate of some kind. This is interesting, l got this from another forum, one which is overrun with scared trolls, unfortunately. I personally don't believe in the Greenland, hanger idea, or the hamster one, (which unfortunately is a reflection) but this certainly shows through amateur and professional images, that Mars has an atmosphere as blue as ours, but NASA keeps churning out red/grey images, and grey/red planet views? Haven't come across multiple images, but l will keep an eye out. Certainly what l have learned elsewhere, is that some will go to any lengths to keep believing that Mars is dead, and there is nothing there except rocks. More is the pity when the truth comes out. Hi Tmcom, could you post a link to the untouched images as well so that we may seem more of each frame that you have been posting. The best l can do Spacenut, is to post this site. 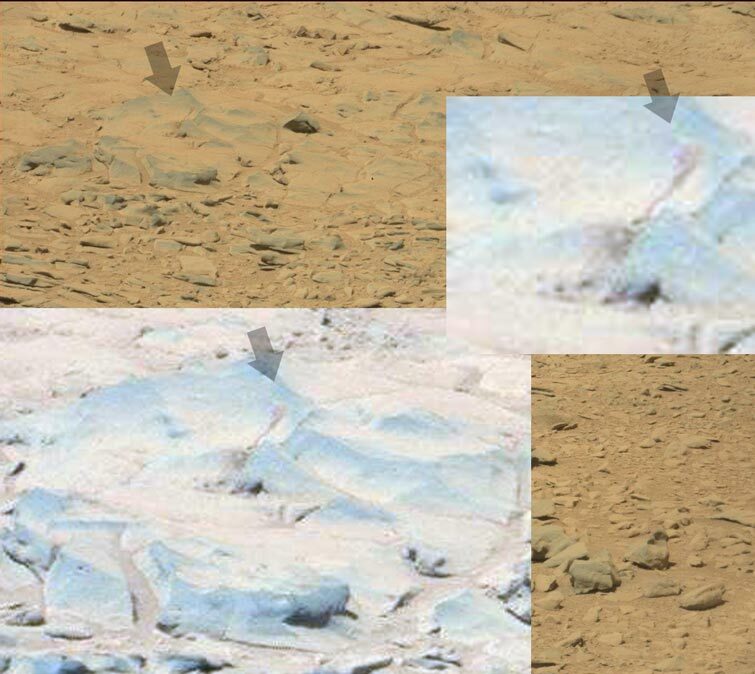 Then scroll down til you reach, "Mast Camera (Mastcam)". 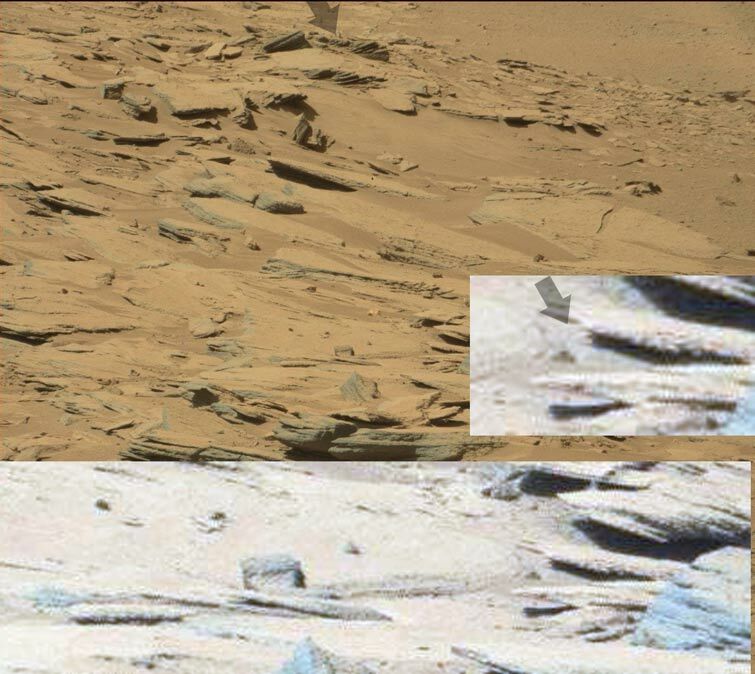 Then using the reference number go to the Sols, so "0551MR0022330210303854E01_D," is Sol 0551... or 551, then using the image run through those til you find it, (only look at the large, color images, l don't bother with the other stuff). I tend to download all of the images then run through them when l can, which is for a short time, now and then, (l am running a pretty labor intensive online business). This is interesting, (my thanks for the individual telling me about it, another forum). And also disappointing. I mean Mars with no atmosphere at the start, and half of the images finally showing how Mars really looks, (blue sky) and the other half the usual BS. 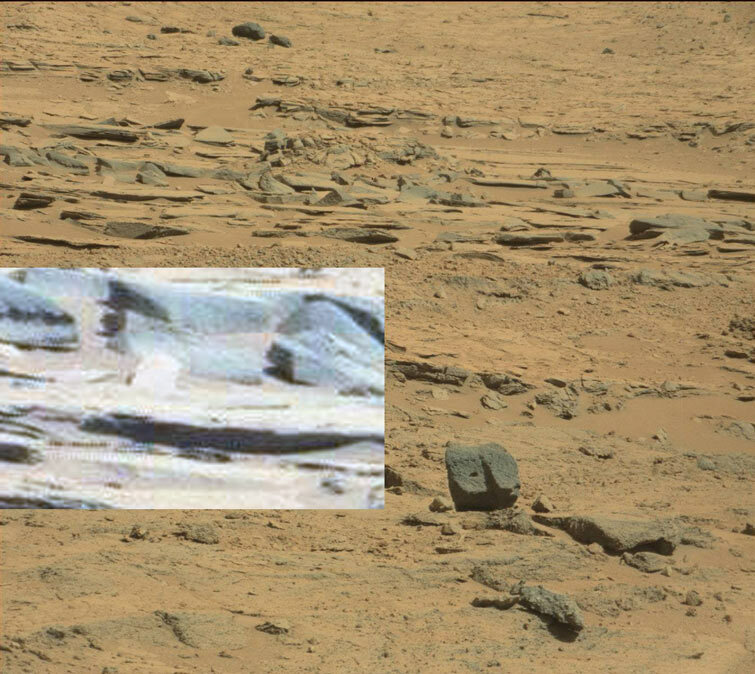 So Curiosity shows 50% blue sky, and normal looking rocks, and the other half, no blue sky, and red/orange everything. While Opportunity and Spirit, with more than 10 years of images, (each) NEVER show one frickin blue sky image! Bluish, grey is as close as they come, and all three use the exact same camera, and color charts. Personally l am amazed that people can still think that Mars is dead, or that NASA is on the up and up. All amateur telescopes show blue sky, as does Hubble, Which means whether we like it or not, Mars has an atmosphere similar to ours. And as the above gaping, chasism issue shows, NASA are lying their brains out, (but at least they are telling the truth, 2% of the time). Found this, looks like water erosion of natural rock formations? And this that looks like a hole. Hard to say whether it is natural or not, but water is flowing away from this point down the hill.